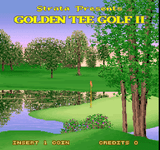 Golden Tee 2 is the sequel to the popular Golden Tee. Game play is identical but has different courses. Graphics are very similar to its predecessor.